Manila's A-listers love to party especially if it is for a good cause. In lieu of gifts, celebrants Mayenne Carmona, Rupert Jacinto and Hera Geriene requested donations to their fave charities. Rupert Jacinto's advocacy is supporting poor churches all over the country thru Sto. Nino de Paz Chapel Foundation . Mayenne and Hera, together with a group of friends, have a feeding program, "Angels to Street Kids". They go to the poorest barangays and feed hundreds of poor children. 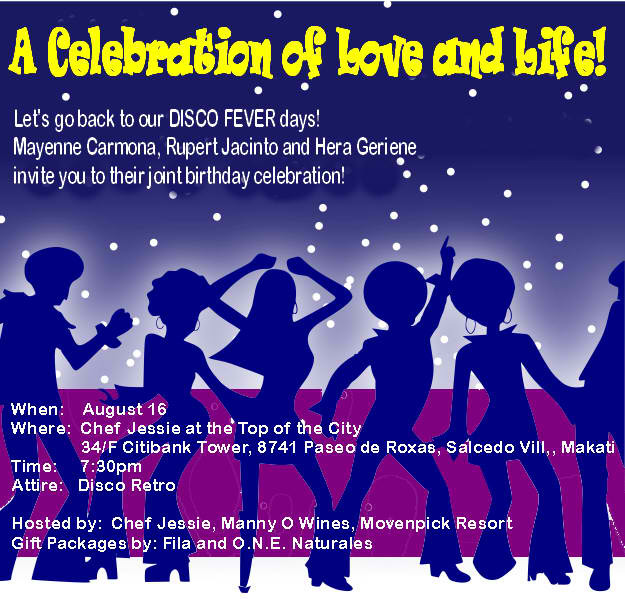 The party's theme was Disco Fever and the guests came in their favorite disco outfits during the 60s, 70s, and 80s, era. Chef Jessie Sincioco, bless her big heart, sponsored the sumptous dinner and Manny Osmena of Movenpick Resorts and Manny O Wines, kept the guests in high spirits with his award winning wines and bubbly. For comic relief, Rene Puno, Linda Ley, Ann Puno, Len Olbes, Rachel de Guzman and Hera Geriene presented a comedy skit. Mayenne danced a sizzling Argentine Tango number with tango dancer William Panga. Guests tripped the light fantastic till the wee hours of the morning. Souvenir gift items were sponsored by O.N.E. Naturales of Charade Galang and Fila of Cris Albert. E-Vite invitation designed by Telly Buhay for the event. Tina Jacinto and Volker Heinen. and our irreplaceable Chef Jessie Sincioco. Mariquita Yeung, and Leo Valdez. Ann Ong's Eyecatching Fashion Accessories!